Garden design is a collaboration and a bringing together of ideas and it is essential to get it right. Richard will work with you from concept to completed design, through the build and finally the planting of your dream garden. If you have pictures of gardens that you particularly like or dislike, then please share them, as it helps to build a picture early on of what you are looking for. There is no fee for your initial consultation. The first meeting is for you to meet Richard and get a feel for how he works and talk through your expectations, allay any fears and start to build a relationship. It is an opportunity to discuss ideas and aspirations for your dream garden. Richard uses a comprehensive checklist that helps build a picture of your likes and dislikes which will form the foundation of your tailor-made design. Once a design concept is agreed, then the next step is a fixed price quotation to produce a detailed garden design. Once you have received your quotation and you are happy to proceed, then the next step is to carry out a detailed site survey arranged at your convenience. The results of the site survey feed into an ‘outline stage’ and the second visit from Richard to discuss the scheme in more detail before producing final plans. The reason Richard works this way is to allow you to be involved in the design of your garden and to have control of the process. The final detailed layout plan and planting schemes are drawn up and will form the building blocks for the costing and implementation of the design. Once the design side is all agreed and signed off, you will receive a fully itemised fixed price quote to build your garden. Richard uses a team of trusted craftsman to carry out all aspects of the construction work, including garden lighting and irrigation. He will oversee every aspect of your build and will keep you informed on how the build is progressing. Richard works with nurserymen who will source and deliver high-quality plants both from the UK and Europe to your garden, ready for planting. As always Richard will be on site to set out the plants and oversee the project until completion. 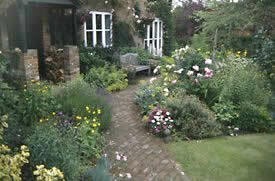 Keeping your garden looking at its best and ensuring it matures and establishes well can be labour intensive. Richard founded Key Gardencare Ltd , a sister company, that can take on all or some of the garden maintenance for you. Headed up by Richard, this first-class maintenance company will take care of your garden for you.